He may be the funniest woman in the world. There’s no contradiction in that assertion. The “he” of it is Australian actor Barry Humphries, white the “woman” (and what a woman!) is his vivid stage persona, Dame Edna Everage, she of the violet hair, the cinemascope eyeglasses, and the arsenic tongue. She disses her family: her deceased husband, who died of complications from a “prostate murmur,” as well as her disappointing kids. Kenny is a “man’s man” who is into flower arranging and choreography and has “lots of friends in San Francisco.” Brucie is an entrepreneur who markets “reconditioned marital aids.” (“Entrepreneur” Edna whispers in an aside, is French for “failure.”) Then there’s her disappointing daughter whose girl friend has so many piercings that, when a breeze blows by, she whistles. How does she get away with it? We know it’s an act, maybe the best drag act ever, and when we’re aware that a brilliant invention like Dame Edna is just kidding, we don’t get mad, we give in and laugh. This is Edna’s fourth visit to San Francisco, and her show is more of the same: scurrilous attacks on innocent bystanders, most of whom would like nothing better than a selfie with their detractor. 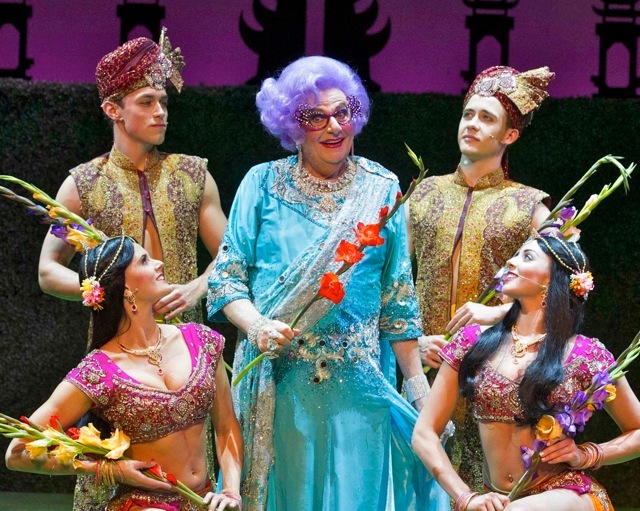 In this enterprise Dame Edna is supported onstage by musical director and accompanist, Jonathan Tessero, and a quartet of lithe dancers: Ralph Coppola, Brooke Pascoe, Eve Prideaux and Armando Yearwood Jr.
Actor Barry Humphries disappears into his larger than life “megastar” with such easy grace that he’s a pleasure to watch. Has anyone ever wrung such delectable changes on warm insincerity? After the show one of my theater companions commented that, five minutes after the star showed up, her face started hurting from laughing. Ah, the pain you love to enjoy! Upcoming shows in SHN’s 2015 season: Matilda, Phantom of the Opera, The Book of Mormon. For tickets/information call 666-746-1799 or visit www.shnsf.com.